Yes, still around, still doing stuff that keeps me from blogging. I finished a few things! Remember last year I had over 25 WIPs? Twenty. Five. Plus. I have 5 now. Five. That means I have 5 things including yarn that I work on weekly. It’s a huge weight off of my shoulders to be finishing these things off! I started so many of them in a desperate attempt to relax. I know, it was counter-productive, but it made sense at the time, and I’ve come a long way since then! I have started framing and hanging old finished pieces too. See the map? So cute in that hoop. 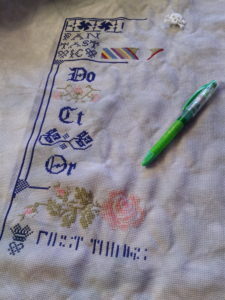 I’m about halfway done with the London cross stitch. ‘m having a lot of fun with it so it’s the only one I’m working on right now, except for a tiny unicorn in my purse for when I’m waiting or out or whatever. Oh, I said something about a major finish? 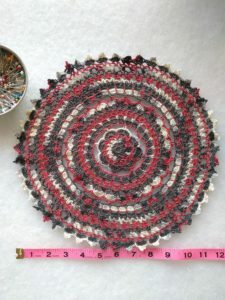 Going through all these projects on my ravelry page, I came across a doily I started waaaay back in 2009! It’s super neat, but I admit it was too hard for me at the time. I kept forgetting it, ignoring it, losing it, having too much trouble with it, etc. I kept it in the back of my head for years, thinking it was too big, too hard, would take so long. 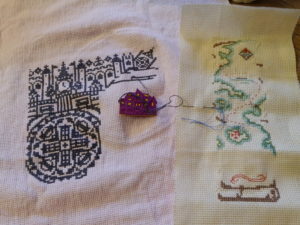 I finished all the little bits in an hour last week, and yesterday I got down to blocking it!! 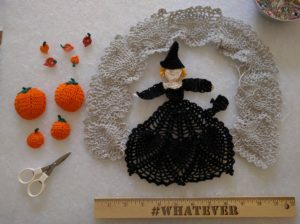 I changed a few things to make it mine, but the original pattern (and she is still my favorite doily designer) is available on Bella Crochet. 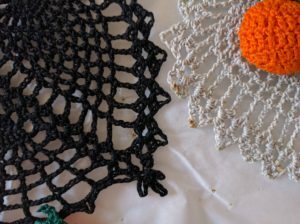 First, I found a basic, no-nonsense how-to on stiffening crochet lace with white glue on Pinterest, original article is here. I used some leftover fabric stiffener from a craft store that I’m suspicious is really just watered down white glue, lol. It worked great! I laid everything out on my foam board to get an idea of placement, then I sewed in ends and made knots and finished what needed to be finished. I made knots in some of them (like the leaves) because I knew they would be glued later. My pumpkins wouldn’t lay flat…so I decided to block them round! I just pushed them out on the back side, like a bubble/bobble. I did the glue step and pinned. I made sure to shape those pesky pumpkins (that were happy to lay flat once full of glue solution) and get the stems perky. The cat’s tail curled on it’s own I love it so I left it. I placed a piece of parchment paper underneath. It took all night to dry so this morning I jumped up and got to it! Unfortunately, my pins are not rust-proof like I thought. Oh well. I can cover that up. I glued the snot out of everything, making sure to cover any rust spots and make sure the piece was attached together (by the pumpkins). You can see the layer of glue underneath. I would recommend doing this without little kids running around, lol, but it worked out! I gave them the glue and some paper and they crafted it up. Ta-da!! 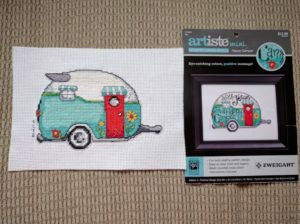 I can’t believe it’s finished! 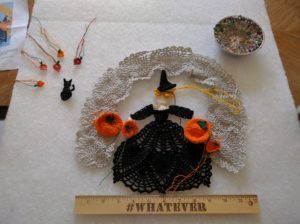 I made her with curly blonde hair, no broom, and fewer pumpkins and leaves. I love this so much! My mom and grandma had a Kitchen Witch in their kitchens, so this one will be mine. I would thin the solution more next time, and squeeze out more liquid. I’ll wear gloves and not get so sticky! Some of the pins were stuck, and I wonder if I had gently squeezed out more water it might have helped…next time. 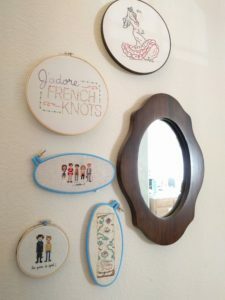 See, I love doilies. I love them like I love knitting socks and this one held me back for too long! 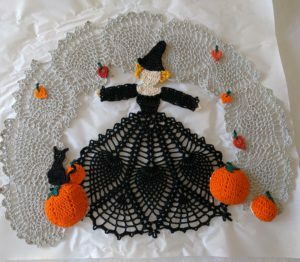 I’m already onto a skull doily and have plans for a candy-corn-Halloweenish-welcome-back-Fall doily…(another Bella Crochet of course). Whew, onto the next finish! 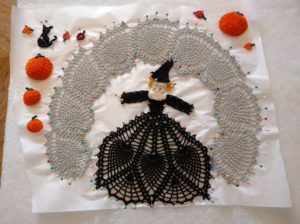 I’m so excited to put this up before Halloween, I’m so ready for Fall and pumpkin spiced everything and scarf weather!! The butterflies are taking a break, a holiday happened, and a short getaway. I finally finished my ninja hoodie! I’m only seven stripes away from finishing (the knit part of) the Dr Who scarf! Plus, I made a lot of progress on Reflections of London, the Sampler in Time, and even a a little bookmark I found stashed away. I changed the bookmark just a bit-I’m using the dark blue on the shoreline instead of brown. I literally turned the corner on this one! I’ve also been watching a lot of Parks & Rec. 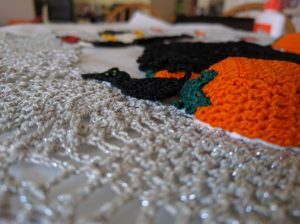 Finished the Poe doily! I’m a sucker for this colorway. 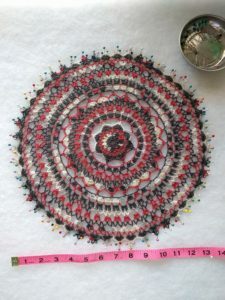 I don’t know where to put this doily yet but I really like it and it was fun to hook up. I’ve been cleaning and planning and organizing and getting ready for summer! Kids are almost out, and I’m planning a family road trip to Colorado, plus a trip to ride the Numbers & Toltec Railroad in June. I’m so excited!! I finished my first pair of socks knit on straight needles. I knit them super quick compared to double circulars, so much so that I frogged about 2 inches of a new sock to start over on straights. Woot! 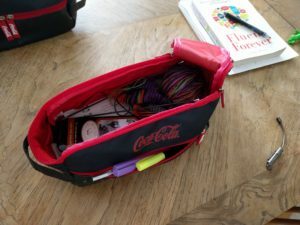 We went to an Isotopes game on Friday and we all got little overnight/travel/toiletry bags at the gate. Wouldn’t you know it, it fits a bunch of projects just right! I fit about 4 in there for now. :-D there are lots of pockets for little stuff. I also got into reading Fluent Forever by Gabriel Wyner. He goes into how we remember languages and has some neat ways to remember in the long run, instead of short term. I’m excited about it! I want to be fluent in Spanish, right now I’m intermediate I guess. I took classes since 7th grade and being in ABQ I’m surrounded by it. I love Spanish and I hope Wyner’s methods will get me to my goal! Maybe if this works I might get back into German…but one thing at a time! 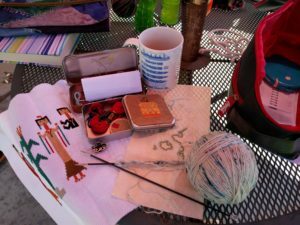 It’s a beautiful day, I’m going to get back to knitting and reading.